Give your child the gift of a lifetime! 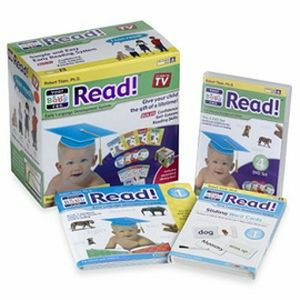 Builds Confidence, Self-Esteem, and Reading Skills! Includes decorative library box! Reading System for Ages 3 months to 5 years! Developed by Robert Titzer, Ph.D. The most natural window of language development is early in life! Multi-Sensory System! How it works: allows your child to learn the written word and the spoken word at the same time. 4 Multi-Sensory DVDs 20 Sliding word & picture cards 4 Lift-A-Flap Books Includes a decorative library box.